Each dance year culminates in an annual recital featuring dancers from all levels – beginner through World Qualifiers. 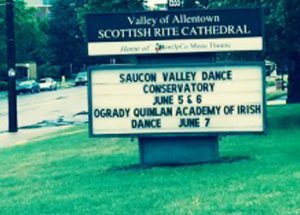 Hosted in early June each year at the Scottish Rite Cathedral, the O’Grady Quinlan dance recital offers sold out audiences an exciting mix of traditional Irish Dance and modern Irish performance dance. Watch for our third annual recital in 2016. We are proud to give every dancer a chance to shine on the “big” stage!